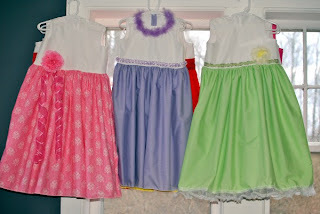 I was asked by a member of my husband's family to make a bunch of party dresses. It took me 7 days of crazy sewing to get them done but I was able to finish in time. I finished a few days before the party so she could look them over and try them on to see if they would all fit the girls. I can't believe I made 12 dresses in 7 days of sewing! It wasn't an easy thing for me to do. I sew every day so I think I'm quick with a sewing machine but this project didn't go quick enough. I felt that my family needed something from me every time I sat down at my sewing machine. I'm sure my family felt that I didn't have any time for them. That was hard for me to live with. 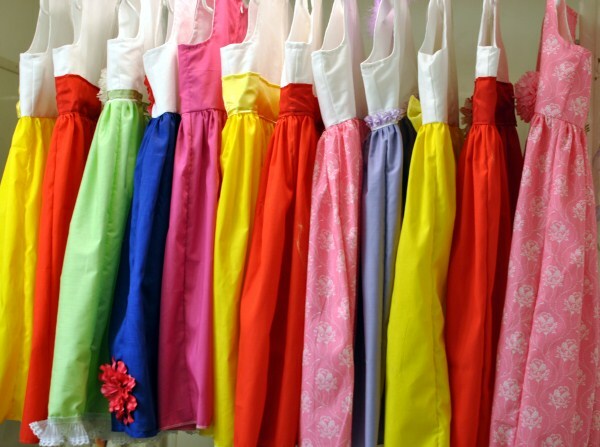 I suggest if anyone asks you to sew 10-12 dresses in under 12 days you take a few minutes to think about it before saying yes. I'm not saying you need to say no... BUT thinking about it before saying yes is smart (I never said I was smart). If I ever did this again it would have to be for a close friend! 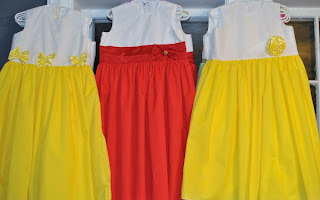 They are not the most spectacular set of dresses I've made but I feel good that I was able to get them sewn in 7 days. I learned a lot with this project! I've made 4 dresses in one day a few times in the past but thinking I could make 3-4 every day was bad judgement. 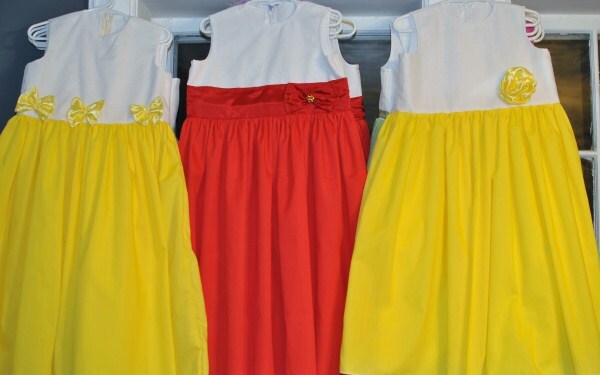 In the future I need to remember my children will only give me a full day to sew 4 dresses IF I spend the day before AND the day after giving them all of my attention. That does not help at all when you have to make more than 4 dresses to make up in a rush. I need to remember that I spend almost as much time adding decorations as I do sewing. 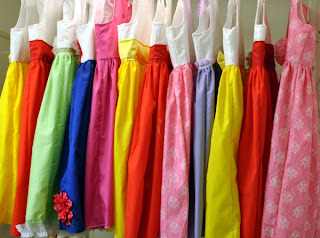 The dresses look very simple but all of that cutting, pinning, and stitching satin and taffeta fabric takes time. They slip so easy you have to take your time. 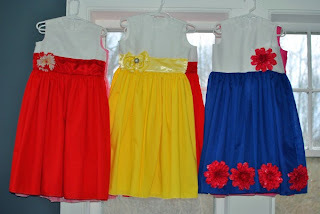 the dresses are cotton so they went together quicker than the trims. I also forgot how long it takes to sew on buttons. I need to remember that everything takes a lot longer than it should when I'm making something for someone other than my kids. My kids never care if I use the serger on the inside seams. 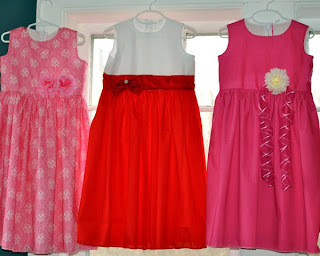 I'll be honest and tell you some of my kids dresses don't have the zipper tacked down at the bottoms. 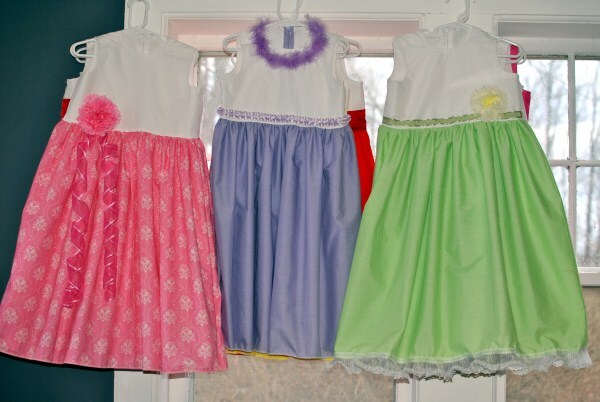 My kids don't care if I have a dozen threads hanging from the dresses. Corners like that can't be cut when I'm are sewing for someone other than my kids! I felt that so many people NEEDED me to do for them when I was in the middle of this project! I felt that I had let my family and friends down the entire time I was sewing. I felt sick telling people I'm sorry I have a dozen dresses I need to finish before I can help. Seeing friends and family looking so sad that I couldn't help them broke my heart! This project has taken away my desire to sew. If I had more time for this project I would have been able to keep working on small projects for my friends and family. I wouldn't have felt like I was neglecting my husband and kids. I would have been able to make nicer dresses.... I feel that I should have said I can't do this project. Honestly, I didn't have a chance to tell the person that this job was too big for me. Sometimes people don't give you much of a chance to say no and if they can hear you might not say yes they give you a big story of why you HAVE to do it. Now that I'm done I am happy I challenged myself and gave it my best shot but I don't think I'll ever do it again. I hope everyone understands why I haven't been blogging lately??? ?